WASHINGTON (CNS) — A not-insignificant part of the diplomatic coup pulled off by the White House and Cuban leaders Dec. 17 was that hardly anyone knew they had been working toward a reset in relations between the two neighbors and longtime antagonists. That the two nations had been negotiating in secret for 18 months and that the Vatican had played a key role in keeping the discussions moving were among the factors that no doubt made the dramatic shift in policies possible. By keeping negotiations among a small number of diplomats and out of the public eye, outside pressures were kept to a minimum. In simultaneous news conferences that day, U.S. President Barack Obama in Washington and Cuban President Raul Castro in Havana announced that their countries were re-establishing official diplomatic relations. Obama detailed a lengthy list of things that will become easier — sales of materials to Cuba’s small-business owners, for Internet technology and for housing construction; visits to Cuba by more Americans; banking and use of credit cards by Americans visiting Cuba; remittances of greater amounts of cash — to name some of the major changes. That’s not to say the 54-year U.S. embargo has gone away altogether. Congress still holds the reins to portions of the laws prohibiting trade with Cuba, intended as a sanction for repression and human rights abuses after the Marxist revolution that put Fidel Castro in power in 1959. He or his brother, Raul, who took over from the ailing Fidel in 2006, have ruled the country ever since. U.S. President Dwight D. Eisenhower first imposed an embargo on Cuba in October 1960. President John F. Kennedy expanded the embargo, and every president since has maintained it until Obama. He is the first to significantly loosen the controls, in 2009 easing restrictions on travel for family and cultural visits and allowing Americans to send more money to their relatives there. Critics of the shift in policy, most conspicuously a handful of Cuban-American members of Congress, say they will attempt to block the changes. Among the steps they suggested are opposing the nomination of an ambassador and restricting funds needed to reopen an embassy in Havana. But Congress also holds the power to retain or end the key parts of the embargo, which were put in place by federal law. The law established the main prohibitions on commerce with Cuba and the ban on travel except as permitted for family, cultural, educational, religious and humanitarian purposes. The most recent national polling on the embargo done by the Pew Research Center in 2009 found a bare majority, 52 percent, of respondents said the U.S. should renew ties with Cuba. But only 33 percent opposed renewing ties. That poll came not long before the Cuban government began a series of changes, including allowing individuals to buy and sell property and to open businesses. More recently, Cuba began allowing its citizens to travel freely, without government authorization. Annual polling of Cuban-Americans in Miami-Dade County by Florida International University has found steadily increasing support for ending the embargo, reinstating diplomatic ties and permitting U.S. citizens to freely travel to Cuba. This year, 68 percent favored reinstating diplomatic relations, with younger Cuban-Americans and recent arrivals backing the changes by even greater numbers, as much as 90 percent and 80 percent, respectively. Tom Quigley, former foreign policy adviser on Latin America and the Caribbean to the U.S. Conference of Catholic Bishops, told Catholic News Service that it’s true what one of the chief critics, Sen. Marco Rubio, R-Florida, says about the need for more progress in changing the political systems in Cuba that prompted the call for an embargo in the first place. “But it’s not going to get any better by leaving the status quo in place,” he added. 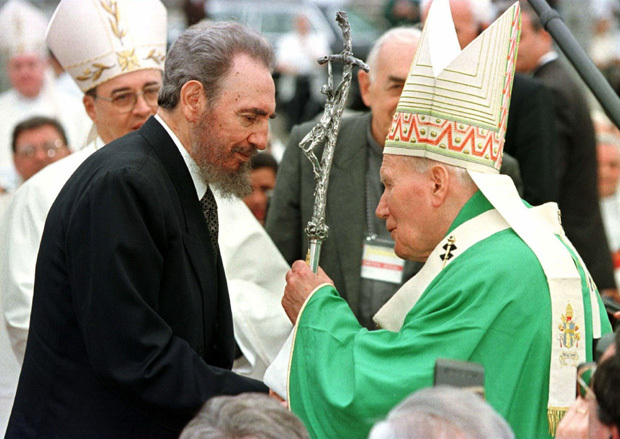 The Catholic Church in both countries has long worked to end the embargo. Yet Stephen Colecchi, director of the USCCB’s Office of International Justice and Peace, said he was unaware of the talks between Cuban and U.S. diplomats until the day of the announcement. Boston daily and Catholic newspapers reported that Cardinal Sean P. O’Malley, one of Pope Francis’ key advisers, played a behind-the-scenes role, helping relay messages between a Boston nonprofit group, Beyond Conflict, that encouraged Pope Francis to intervene with Obama to press for an end to the embargo. When Obama and Pope Francis met in March, Cuba was reportedly one of their main topics of conversation. For years, the Cuban bishops have worked steadfastly to diminish the emotional distance between Cubans and their Cuban-American relatives. Archbishop Dionisio Garcia Ibanez of Santiago de Cuba, president of the Cuban bishops’ conference, used the 2012 observance of the 400th anniversary of Our Lady of Charity of El Cobre, to encourage Cubans worldwide to unite across borders. He became a regular visitor to the U.S., especially to Cuban emigre communities in Florida and New York. By the time Pope Benedict visited Havana, Santiago and the shrine of El Cobre in 2012, thousands of Americans went to join him. From Miami alone, nearly 1,000 people went on flights chartered by the archdiocese. Under Obama’s 2009 orders allowing more “people to people” travel to Cuba, the idea was for interactions between everyday citizens of both countries to help pressure Cuba’s leaders to bring about more improvements. Archbishop Garcia’s goal was framed in more theological terms, but he was clear about what he hoped would happen if people would come together in a spirit of pilgrimage.